The website Groomstars.com is founded on an interesting idea - that being the concept that men are hard to shop for (especially when it comes to gifts for special occasions). As the name of the site implies, the focus of the site is offering gifts for the men who participate in weddings (not like routinely or anything). Along with the fact that guys are not super easy to shop for, most gift websites usually have items that either appeal only to women, or are gifts guys don't normally want. Groomstars strives to offering an enticing selection of male-minded gifts, and like many other gift based websites, Groomstars also features most (if not all) of their products as being personalized. Featured products including a range of decent quality pens, holders, valets, watch cases, clothing accessories, hobbyist goods, nice tools, and other things men usually like, but wouldn't normally buy for themselves. I actually appreciate the selection a lot. It is as though someone waded through most of the obvious (and many non obvious) gifts a man would like and presented them in an easy to navigate place. A lot of people will likely enjoy the site when shopping for groomsmen, a best man, the father of the bride - or anyone else who may be a friend, boss, or relative. Prices aren't cheap, but part of what you are paying for is the curated content. One such item that is nice is the Groomstars Striped Wedge Wood Watch box. 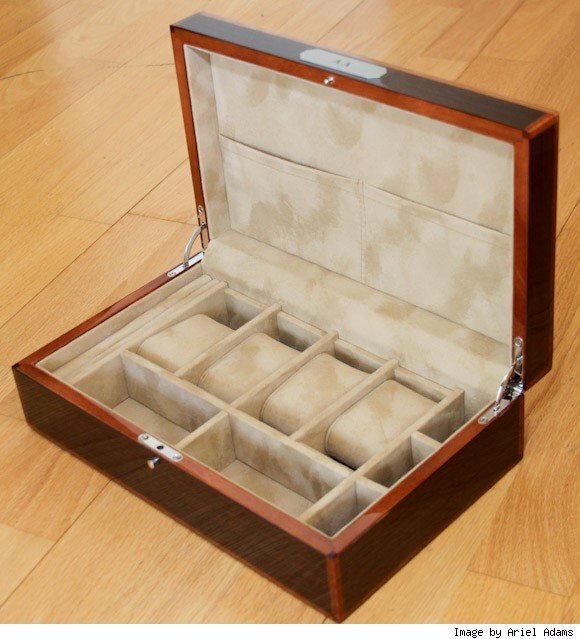 It contains space for a few watches and related accessories, while the inside is cloth lined to prevent scratching. It comes in a nicely veneered closing box case with a personalized plate near the push-button opener. The inside is lined with soft cloth and quality is better than you might expect (or perhaps I simply have jaded expectations). Their watch boxes also come in a few different finishes and retails for $265 - all of course available for purchase online. Groomstars.com Review - Formal Gifts For Men originally appeared on Luxist on Wed, 27 Apr 2011 12:04:00 EST. Please see our terms for use of feeds.